Olmert “lost his faith in Jerusalem” says Mayor Nir Barkat. Jerusalem Mayor Nir Barkat criticized a former Jerusalem mayor, ex-prime minister Ehud Olmert, over Olmert’s failed plan to split Jerusalem with the Palestinian Authority. The plan stalled when the PA left talks without signing an agreement. “Olmert makes a bitter mistake in thinking that separation, not unity, is the solution. His words are demagoguery,” Barkat said on Sunday. 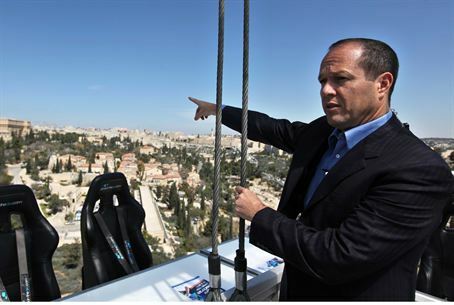 Most Israelis, most Jerusalem residents, and even most Arab residents of eastern Jerusalem, are not interested in splitting the city, Barkat added. “I have no doubt that the right thing to do in Jerusalem is to continue to invest and to unify instead of running away and hiding our heads in the sand – as was done in the past,” he concluded.